It is certainly relevant this time of year to entertain ideas of magic, divination, spirits and concoctions. These may seem too dark or even silly for you but the witches of La Paz, Bolivia, and their patrons, take it quite seriously. 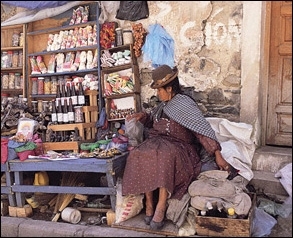 Read more about the Witches Market of La Paz, Bolivia in our latest e-Newsletter. At PC we are always trying to find new ways to breathe some life into our menswear collection. In the past, we have successfully offered men ethnographic and bold patterned options as well as the more subtle knits and textures. But we admit we are still trying to capture that perfect formula of quality, comfort and the unique character we are renowned for. One of the many jobs that I have here at PC is casting the models for our catalog. (A pleasant task indeed – see above.) While models always look good in our men’s designs I’m curious what some of your suggestions might be for our men’s collection. What would you like to see? Please feel free to share! We just returned from an island off the coast of Turkey where we photographed our Spring 2008 catalogue. As we looked at the film upon our return we are again struck by the beauty of our island hideaway and it’s charming yet primitive amenities. It was the perfect backdrop for our new range of woven apparel that will be introduced in our Spring catalogue this January. Get ready…paired with our stunning knitwear collection, these new woven designs will blow you away! Similarly, while on the shoot our hair stylist tries to tame the windblown hair of our model as they stand on the crenelated wall of a Roman castle. Annie lends an extra hand of safety at her waistband (see above). Now that the cool winds of Autumn are upon us, it’s time for me to put away my warm weather madras plaid and bring out my wooly tartan plaids. Plaid has long been a staple in this Scottish household (Lochsloy!) and while my devotion to our lineage is earnest, my clan colors are not always (how shall I say this?) fashionably relevant. Fortunately, I have found the answer. 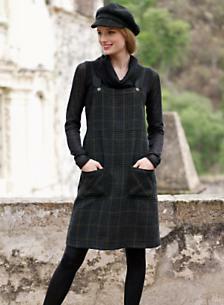 I can begin my transitional season dressing with our Plaid Overall Dress. Unlike my own clan tartan, this plaid is a subtle blend of menswear hues made from our exclusive lightweight alpaca/wool blend fabric. This design makes me feel like Meg Ryan in "You’ve Got Mail" walking around New York with an optimistic school-girl sophistication. Perhaps it is the fondness for of all-things Autumn but it could be the simple nostalgia for plaid, bringing back the memories of parochial jumpers and our carefree days of youth. One of my favorite things about Peruvian Connection is a long and enduring commitment to our community of artisans. Since Annie’s first visit to Peru back in 1976, we’ve been proud to work with skilled craftswomen whose efforts are rewarded with good wages and clean, safe working conditions. But sadly, these women are in the minority. A staggering 70% of Peruvian women work in precarious conditions with low income and virtually no access to social benefits. Their best opportunity to earn money is to operate a small business. These women are willing to invest the long hours it takes to operate and grow their business, but without capital or training, survival is difficult … and success is rare. Pro Mujer helps Peruvian women—and working women in Bolivia, Mexico, Nicaragua and Argentina—rise above the poverty line with access to micro-loans, basic business training and affordable healthcare services. We’re proud to support Pro Mujer Peru, a nonprofit organization that shares our philosophy of respect for other cultures, the fostering of artisan traditions, and ecological and economical sustainability. If you’d like to help, you may make a tax-deductible donation to Pro Mujer on our site, or purchase a luxurious throw, the proceeds of which go directly to Pro Mujer. 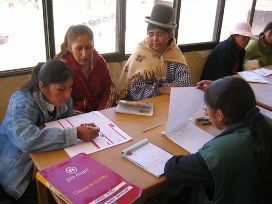 To learn more about Pro Mujer’s work, visit www.promujer.org.